Also posted in Erasmus+, Himaláje, Jiné, Rumunsko, Školení, Srbsko, Tábory, Ukrajina | Komentáře nejsou povolené u textu s názvem Co se dělo v roce 2016? Cities always seemed living creatures for me. They have their own character, they can have bad and good mood. They can show you their secret places, arrange accidental meetings with your friends and bring good luck (or, sometimes even more important – good coffee) when you need it. That’s why I love new ways of discovering the city. Alternative excursions, self-invented games – everything counts in your dialogue with the city. 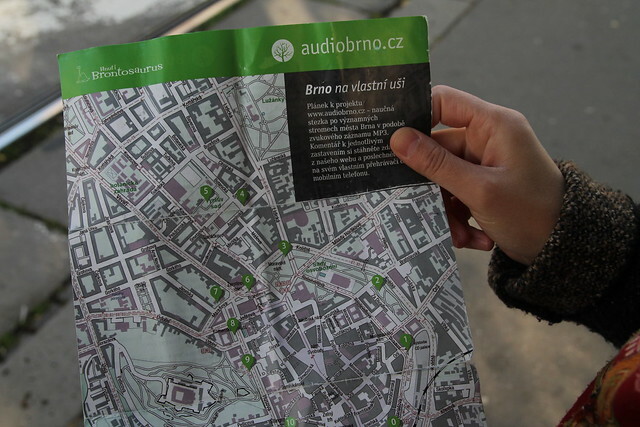 And here in Brontosaurus there is one very good way to explore the city – a trail around interesting trees of Brno, called AudioBrno. On the website you can download the map and the description of the trees (or the audiofile of it, if you want to practice your czech). One of the changing points of my life was a training called School of Eco-Activist. It was the first training I’ve ever participated in, and I was immediately fascinated: by the non-formal education atmosphere with place for discussions and no authority, by the trainers who shared the values they were talking about (and it was seen through their actions), and mostly – by the topic, both challenging and inspiring. Saving Nature.